The colonial hill station of Pyin Oo Lwin (Pyin U Lwin) was a summer retreat during British rule, its altitude of 1,070m and relatively cool climate allowing the British ruling class to escape the fearsome heat of Mandalay and lower Myanmar. During that era, the town was called Maymyo (meaning ‘May’s town’ in Burmese, after a British colonel who was stationed there), and is still sometimes referred to this way today. Although now blighted by more recent building developments, Pyin Oo Lwin’s colonial legacy still holds the key to the town’s charm and the surrounding area offers plenty to explore, including a number of magnficent waterfalls. Pyin Oo Lwin’s beautiful botanical gardens are unique in Myanmar and the town itself does retain a number of characteristic examples of 19th century country houses, several of which are now hotels. The most famous is The Candacraig, a colonial mansion built in 1904 and described in some detail by Paul Theroux in The Great Railway Bazaar; although currently closed, it is sometimes possible to find your way inside. Another beautiful example is the Governor’s House. To this day, colourful wooden horse-drawn wagons are one of the primary forms of transport around town. For a wider selection of photos from Pyin Oo Lwin, go to our Flickr photo album. We offer a variety of tours of Myanmar that include the sights of Pyin Oo Lwin - find out more here. Officially named National Kandawgyi Gardens, the botanical gardens were opened in 1915 and are still beautifully maintained. They are home to a wide variety of colourful flora and fauna, including dedicated flower shows and wildlife including gibbons and takin, goat-antelopes that are native to the Himalayas. There is a tall viewing platform from which you can see 360 degrees around the entire park and across to Pyin Oo Lwin and the surrounding area. Take a look at our YouTube video of the gardens. There is a US$5 entry fee for the gardens and you can get there by motorcycle taxi from downtown for K2000 (horse carriages are more), or alternatively take a 20-30 minute walk. 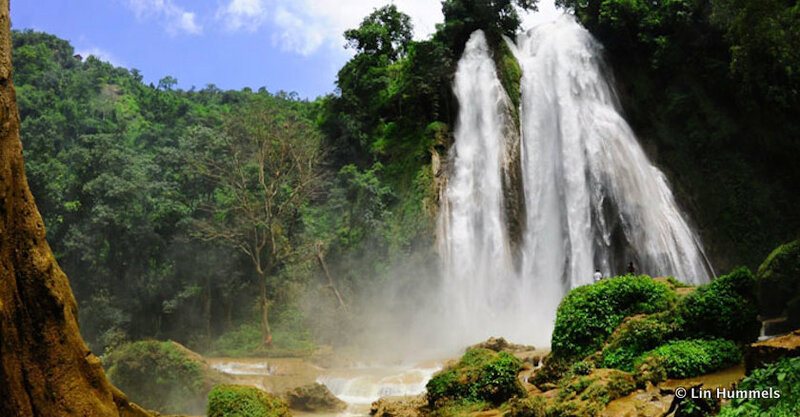 To the east of Pyin Oo Lwin are are the Pwe Gauk falls, which are a series of small waterfalls and a popular place for locals to hang out, particularly during the holidays. A pleasant place to relax and while away an afternoon, you will find simple restaurants in the area for refreshment, and it takes around 15 minutes to get there by road from Pyin Oo Lwin. The most impressive waterfall in the area is the Dat Taw Gyaint waterfall, just outside Anisakan, to the south west of Pyin Oo Lwin. Situated at the head of a deep ravine, the lowest part of the waterfall splashes dramatically into a pool of crystal clear water in which you can swim. There is an unusual earthen pagoda by the pool, and you can get snacks and drinks there - after the half hour walk down from the car park at the top of the ravine. Overlooking the Dat Taw Gyaint waterfall from the opposite side of the ravine is The View restaurant, which is attached to a hotel. Both restaurant and hotel are overpriced, but they are elegant and offer great views of the surrounding landscape. See our YouTube videos of the waterfall and pool and looking down at the ravine from the restaurant. The Peik Chin Myaung cave is one of the most attractive in Myanmar, featuring colourful Buddhist scenes, a large number of shrines and a picturesque waterfall at its entrance. It can be found approximately 20km to the east of Pyin Oo Lwin off the road to Lashio. The Seven Waterfall Trek is a spectacular hike through thick jungle that leads to several impressive waterfalls. Over an hour out town, this day trip requires a motorbike and a decent map or hiring a taxi. Read more about the trek and similar outdoor activites here. To explore the area around Pyin Oo Lwin, you can either hire a taxi (around K40,000 for a full day) or do it by yourself on a motorbike (K10,000 per day). Taking the train from Pyin Oo Lwin to the scenic and laid-back town of Hsipaw (or further on to Lashio) makes for one of Myanmar’s most fascinating journeys, taking in the northern Shan hills and the famous Gokteik Gorge and viaduct. For more information on this route and rail travel in Myanmar, go here. There are a number of restaurants dotted around Pyin Oo Lwin. Two of the best have pleasant views of Kandawlay Lake, which is not far from most hotels. Feel Lake Front is part of a quality local food chain and The Taj serves a variety of very tasty Indian dishes. The Pyin Oo Lwin hot air balloon festival takes place in November - it is similar, but smaller in scale, to the festival in Taunggyi, which takes place at the same time of year. For dates and full Myanmar festival listings, go to our festivals calendar. There are Visa- and Mastercard-ready KBZ and CB bank ATMs located on the Mandalay to Lashio Road in the centre of Pyin Oo Lwin.